Our hearts are overflowing and we are looking to share it! Read below about how we can help you and your community experience acupuncture for free! In just a couple of days, the summer solstice will be upon us. The days are long, the sun is shining, the flowers, trees and veggie gardens are in full bloom. This time of year is always a time of great joy. I love being with my people connecting--whether its at the neighborhood pool, a summer party or sitting on the front steps with a cool drink. Earlier this week I joined with my friends Janene Borandi of Borandi Acupuncture and Nicole Asbahr of Inner Nature, two amazing acupuncturists practicing in Laurel at an event at Earth Treks in Columbia. Over the course of 3 hours we offered free acupuncture to almost 30 people , most of who had never experienced this beautiful medicine before. 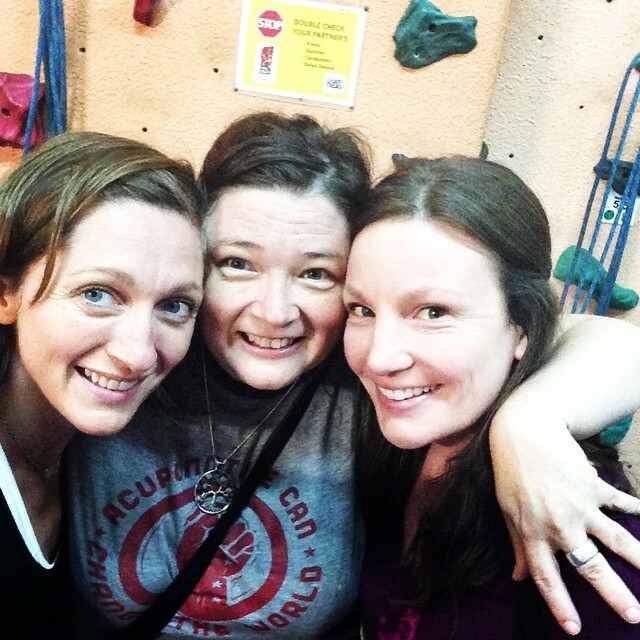 Janene is an avid rock climber and the people at Earth Treks are part of her beloved community. She wanted to give back to them by offering the experience of acupuncture and Nicole and I were her willing conspirators. Back in school, the three of us had practiced together in the student clinic on Monday and Thursday nights and it was a joy to be back in their company, sharing this medicine we love so dearly, giving it away freely. By the end of the night we all felt exhilarated with hearts overflowing and we reflected to one another that this is what summer is all about--connection, partnership, passion and joy--sharing what we love with our beloved communities. And we want to do it again! And we want to offer it to you! At its best, Chinese medicine is preventative medicine. While acupuncture is "good for" many conditions, truth be told, its at its best when it is simply helping your body, mind and spirit come back into balance so that you are ready to face whatever stresses life throws at you. We love the idea of putting together these acupuncture experiences to share and teach and treat. So let's partner together to spread the joy of wellness! Do you belong to a group that may want to experience acupuncture or a group that could use the gift of relaxation, detoxing, de-stressing and recharging? Maybe its at your workplace or church or gym or neighborhood pool. Maybe you have a community of friends interested in wellness and want to gather them in your house. Or maybe you know a bunch of teachers who just finished the year and could use a break or you work with a group of brave but exhausted first responders or are part of a community of activists fighting the good fight. It doesn't matter. Your people are our people! If you can gather together your community** we can come and deliver acupuncture treatments intended to relax, restore & recharge as well as some coaching and information about magic of Chinese medicine. And the cost is--well--free! If you would like to collect a small donation for your favorite charity we wouldn't object as long as it was voluntary and folks were clear where the money was going. (If you want to collect money for one of our favorite charities, groups that offer free acupuncture treatments to support recovery from addiction to the residents of North Baltimore and groups that offer free acupuncture treatment and support to veterans and their families we can connect you) We just want to share the power of the medicine, give the world a little taste and open our hearts. Do you want to play with us? If so, email me at megcaseyacupuncture (at) gmail (dot) come or use the contact me section on the website here to shoot me a message. We can see if there is a date that works for us all. We can't wait to partner with you! **We would need to gather at a place in Maryland due to licensure rules and we would need to find a time that works!